KNAC.COM - Reviews - SONS OF APOLLO In Anaheim, CA With Photos! SONS OF APOLLO In Anaheim, CA With Photos! Chemistry. Defined as “The study of the composition, properties and structure of substances, and the changes they undergo.” We all know what that means when it comes to relationships. In music, it can mean a variety of things. As for a band that MAKES music, it is combination of emotions, relationships and skills, collectively as one. This is a rarity, it seems, when it comes to bands and musical relationships with one another. Recently, I witnessed said rarity in the form of the band SONS OF APOLLO. 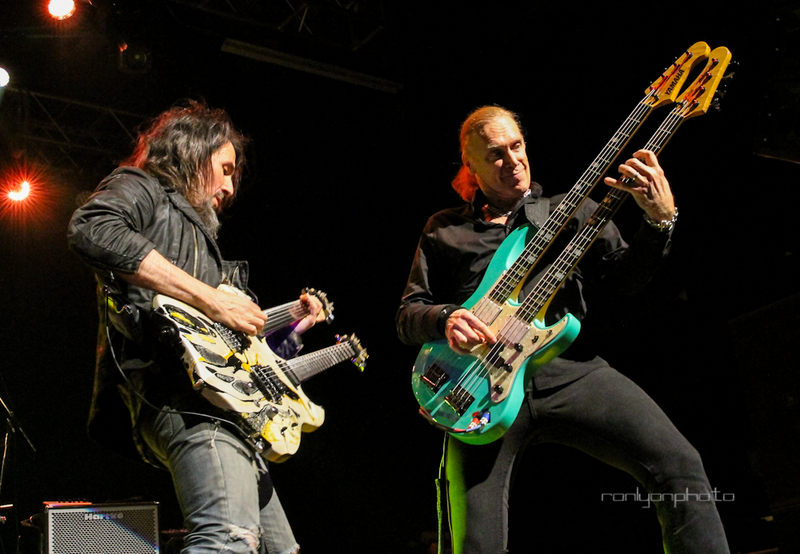 Comprised of 5 virtuosos, drummer Mike Portnoy, bassist Billy Sheehan, guitarist Ron “Bumblefoot” Thal, keyboardist Derek Sherinian, and vocalist Jeff Scott Soto, SOA members individually (and some together) have been in a lot of different musical projects over the years. Bands like DREAM THEATER, YNGWIE MALMSTEEN'S RISING FORCE, GUNS N' ROSES, TALAS, and lots of others. All technically sound, musician wise, but not always relationship wise. Here’s whereSONS OF APOLLO differs. Just by watching and seeing them onstage, the audience knows IMMEDIATELY that the band members respect and actually LIKE each other! That is the rare part, especially when it comes to a band that makes music as technical, and diverse, as SONS OF APOLLOdoes. It is a joy to the eyes and ears. Especially for fans, like myself, of music made by brilliant musicians, as opposed to a lot of the inferior material that is hurled at us constantly, by non-musicians with computers, and attitude, who haven’t got a clue or a care in the world about the process of mastering the craft of musicianship. Friday night in Anaheim was the scene to witness this crew make their mark. After some interesting opening acts, SIFTING, and FELIX MARTIN, who were both technically sound, the PA cranked the familiar sounds of VAN HALEN’s 1982 “Intruder” intro. 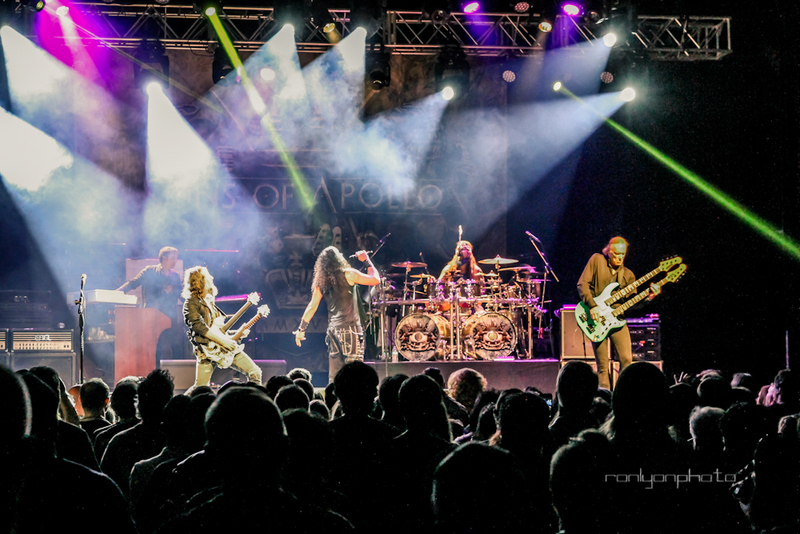 In flurry of flashing lights, SONS OF APOLLO appeared one by one, and launched into “God of the Sun” from their debut release Psychotic Symphony. From that moment on, I was entranced.Jeff Scott Soto. Soto is a very dynamic front man, and an exceptional singer. He bounced all over the stage, very much in tune with the audience, clearly enjoying himself, as he hit notes with power and passion. He also knew when to step away and let his band members shine. And it happened all through the set. Thal was very impressive, not only with his playing on his double necked, L.E.D. lit Vigier guitar, but with his backing vocals, which never wavered. During a cover of DREAM THEATER’s “Just Let Me Breathe” Soto did just that, and let the band member’s rock. Sherinian had a huge stage rig, with at least four keyboards, including a Hammond organ, that produced gut-thundering low end. And yet, his delicate piano intro to “Labyrinth” was as light as air, and reminiscent of a Jonathan Cain-era JOURNEY ballad. I was glad to see him bring so much to this band, as I always felt his talents were under used on other recordings that he has been on. After a blazing version of “Lost in Oblivion” it was Soto’s time for a “Soto Solo.” Being a huge fan of the band QUEEN, he chose a sampling of that bands “The Prophet Song” and “Save Me” to spotlight his vocal chops, which he did, flawlessly. 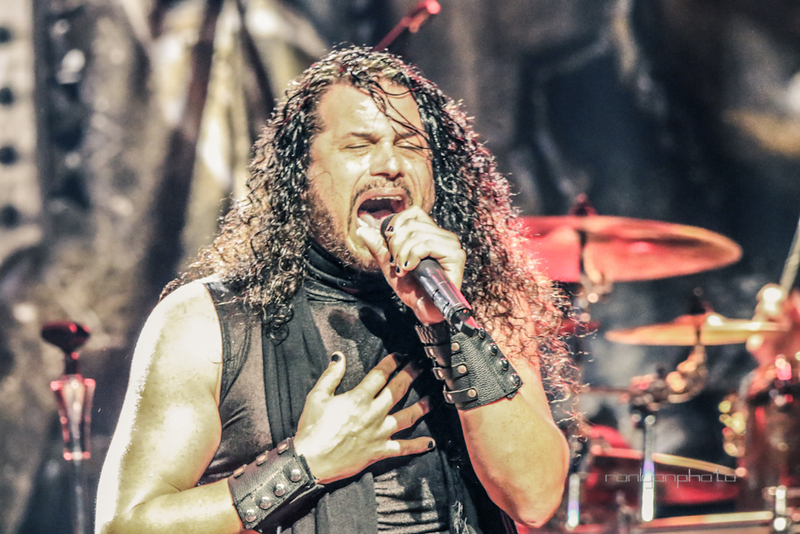 Freddie Mercury was a big influence on Jeff Scott Soto, not only in voice, but in his theatrical moves onstage, and I applaud Soto for using his huge vocal range to being able to meld his style so gracefully with that of his hero. 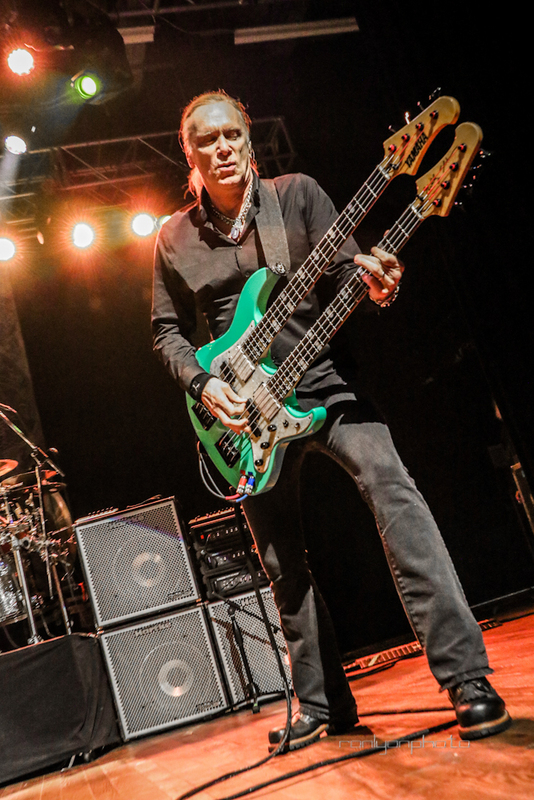 The band took a lighthearted turn with a tempo change, and a stab at the Henry Mancini penned classic “Pink Panther Theme” of which Thal and drummer Mike Portnoy started. The band members clearly had fun with this one, and Portnoy, a master behind the drum kit, grinned the entire time. 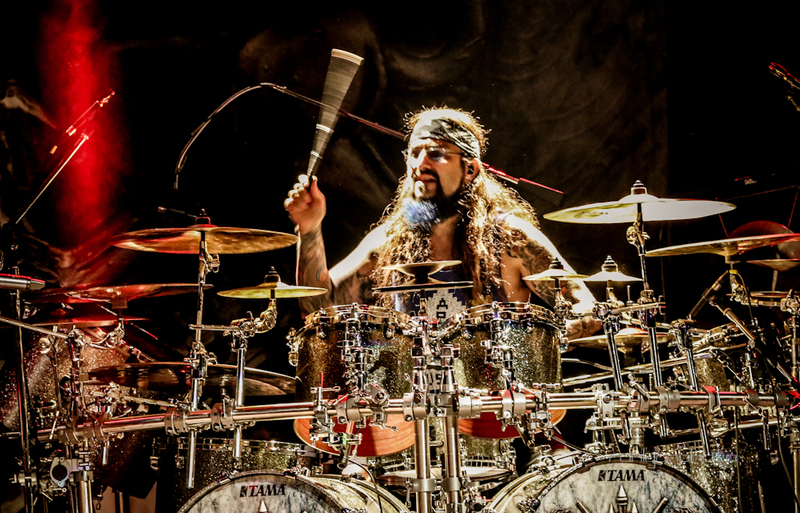 After that, it was back to business, as the band tore into “Opus Maximus” and Mike Portnoy showed off his incredible drum skills that matched his bandmates prowess note for progressive note. 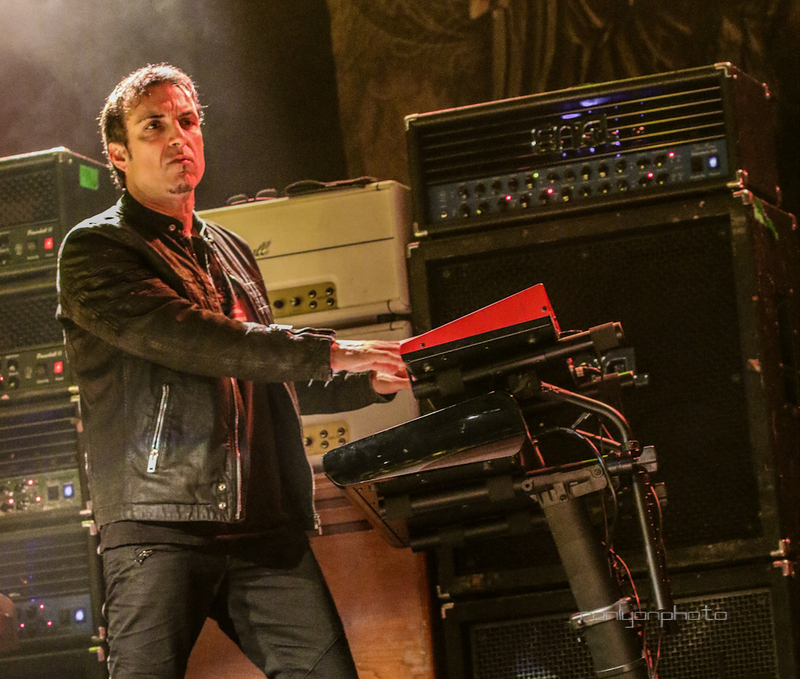 Derek Sherinian took stage center for his keyboard solo, and his wizardry and mastery of at least four different instruments, including the afore-mentioned Hammond organ, brought back memories of 1970’s epic solos from DEEP PURPLE’s Jon Lord and the late Keith Emerson. As I alluded to earlier, it is wonderful to see Sherinian be out front in the mix and get appreciation and acknowledgement of his skills as he does with SONS OF APOLLO. In my opinion, it is long overdue. After a revved up version of DREAM THEATER’s epic 1997 song “Lines In the Sand”, the band left the stage, and the audience exploded, clearly pleased and wanting more. And more they got. 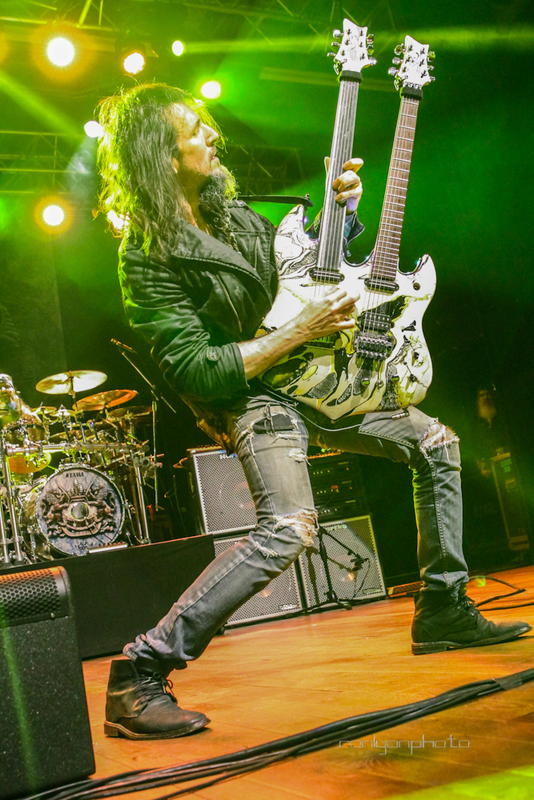 Thal ripped out the beginning to the VAN HALEN classic “And the Cradle Will Rock” as Jeff Scott Soto appeared in the audience, near the bar, and began to belt out the lyrics. He strolled through the crowd, posing for pictures with his fans, as he made his way back to the stage, never missing a note. As he climbed back up and strode center stage, he exclaimed “Wait for it..” He then held his microphone high as the crowd responded with the mid-song refrain of “Have you seen junior’s grades?” Here was Soto channeling another hero, his inner David Lee Roth, and SONS OF APOLLO gave that nearly 40 year old song new life, as the band members grinned, from ear to ear, clearly pleased. Finally the band capped their performance with “Coming Home”, which was interesting in many ways. During part of the song, Jeff Scott Soto sang the chorus without the aid of a microphone, just him and his voice, alone in the cavernous venue. He coaxed the audience to join him, and they responded. Another interesting coincidence was the song's title for the last number being that the mostly Los Angeles area residents were heading out the next day for a national tour. It’s a great song, again from their debut release, and at its conclusion, Soto introduced each member with a rhyming verse. There was the “ringmaster” having a good time with his friends. I applauded and appreciated every minute of this performance. It was such a refreshing sight to see such gifted musicians working together as one, and enjoying it themselves. Bands are like marriages, there are good ones and bad ones, it’s an old story, but the really good ones are the ones that stand the tests of time. I hope that the dozens of other projects that the members of SONS OF APOLLO are involved in, will allow for more time with this one. I’m sold on it. Bravo to all, for a job well done.